Contents: M. Tomasello, Introduction: A Cognitive-Functional Perspective on Language Structure. R.W. Langacker, Conceptualization, Symbolization, and Grammar. T. Givón, The Functional Approach to Grammar. W. Croft, The Structure of Events and the Structure of Language. W. Chafe, Language and the Flow of Thought. A. Wierzbicka, The Semantics of English Causative Constructions in a Universal-Typological Perspective. P.J. Hopper, Emergent Grammar. J.R. Taylor, Syntactic Constructions as Prototype Categories. A.E. Goldberg, Patterns of Experience in Patterns of Language. R.D. Van Valin, Jr., The Acquisition of WH-Questions and the Mechanisms of Language Acquisition. G. Fauconnier, Mental Spaces, Language Modalities, and Conceptual Integration. "I found that each chapter presented readable sketches of the current thinking of some linguist....present thought-provoking semantically-based analyses of phenomena that in the past have been treated mainly syntactically. 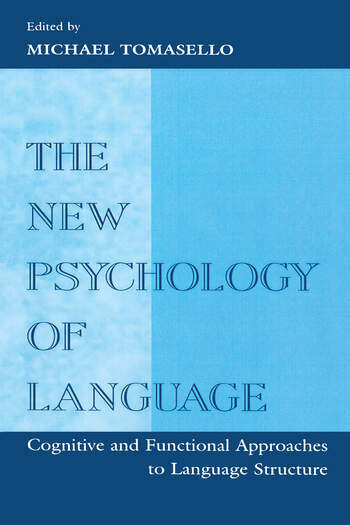 "...this collection offers a broad sampler of some current functional approaches to the analysis of language, and in doing so it raises a number of questions that are fundamental for research on language acquisition as well as (adult) language use."